Pertandingan di Grup F Piala Dunia FIFA 2010 akan diadakan dari tanggal 15 Juni sampai dengan 25 Juni 2010. Grup ini terdiri dari Brasil, Korea Utara, Pantai Gading, dan Portugal. Grup ini juga dianggap sebagai Group of Death. Pemenang grup ini, Brasil, melaju melawan Chili, runner-up Grup H di babak gugur. Runner-up grup ini, Portugal, melaju melawan Spanyol, pemenang grup H.
^ fifa.com. Match Schedule 2010 FIFA World Cup South Africa. Siaran pers. Diakses pada 2009-12-06. ^ Latham, Brent (4 May 2010). "Group D is the toughest group". ESPN.com. ESPN. Diakses tanggal 14 May 2010. ^ a b c d e f g h "Referee designations for matches 1-16" (PDF). FIFA.com. Fédération Internationale de Football Association. 5 June 2010. Diakses tanggal 5 June 2010. ^ a b "Tactical Line-up – Group G – Cote d´Ivoire-Portugal" (PDF). FIFA.com. Fédération Internationale de Football Association. 15 June 2010. Diakses tanggal 15 June 2010. 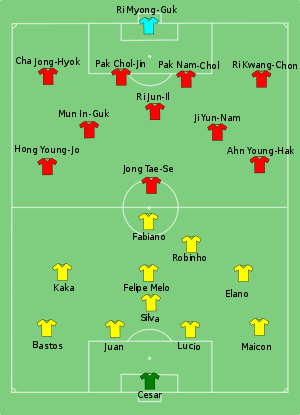 ^ a b "Tactical Line-up – Group G – Brazil-Korea DPR" (PDF). FIFA.com. Fédération Internationale de Football Association. 15 June 2010. Diakses tanggal 15 June 2010. ^ a b "Tactical Line-up – Group G – Brazil-Cote d´Ivoire" (PDF). FIFA.com. Fédération Internationale de Football Association. 20 June 2010. Diakses tanggal 20 June 2010. ^ a b "Tactical Line-up – Group G – Portugal-Korea DPR" (PDF). FIFA.com. Fédération Internationale de Football Association. 21 June 2010. Diakses tanggal 21 June 2010. ^ a b "Tactical Line-up – Group G – Portugal-Brazil" (PDF). FIFA.com. Fédération Internationale de Football Association. 25 June 2010. Diakses tanggal 25 June 2010. ^ a b "Tactical Line-up – Group G – Korea DPR-Cote d´Ivoire" (PDF). FIFA.com. Fédération Internationale de Football Association. 25 June 2010. Diakses tanggal 25 June 2010.